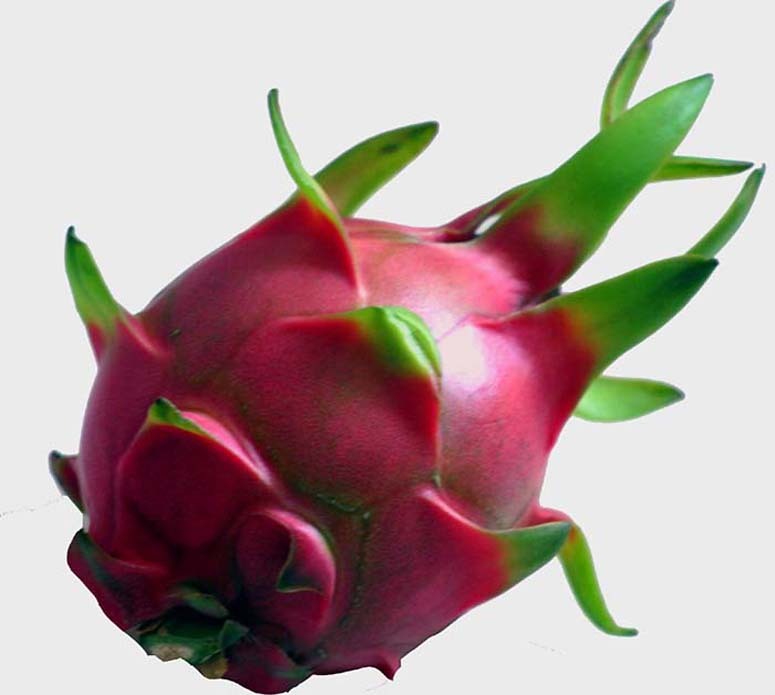 Pitahaya Fruit aka Dragon Fruit, or devils gut. 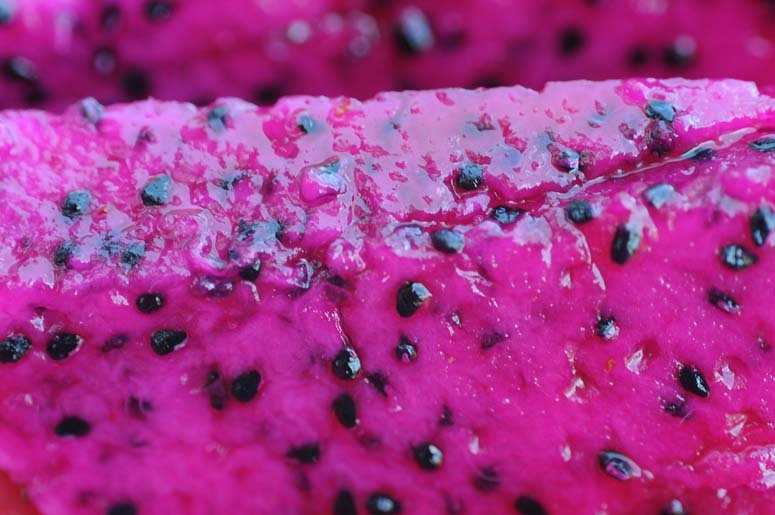 Pitahaya is a parasite that grows on trees, growing on a cactus vine, varieties such as Hylocereus polyrhizus, Hylocereus undulatus and Stenocereus queretaroensis. 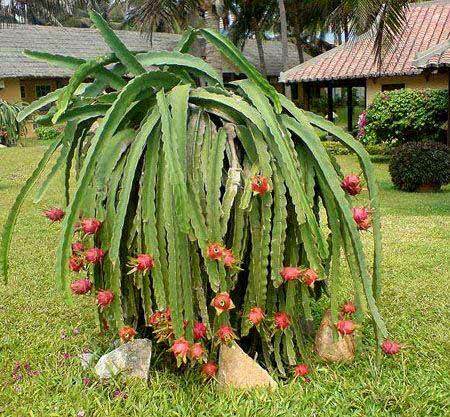 The cactus vine can grow in the ground or off trees. It is propagated by cuttings. 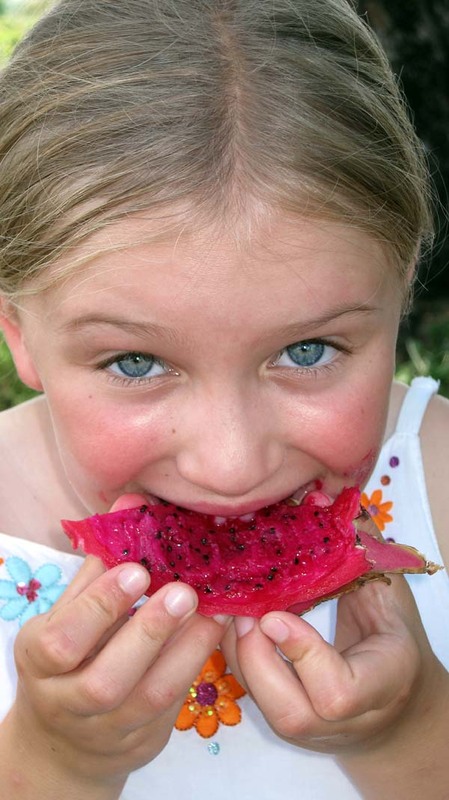 The vine produces large flowers, then the Pitahaya fruit. The fruit is oblong, and about 4 inches long (10 cm) with rubbery skin that is either yellowy-orange and rough, bumpy, and prickly-looking, or pink and smooth with triangle-shaped appendages growing from it. The skin is inedible. Some find it easiest to peel them by holding them with a fork. 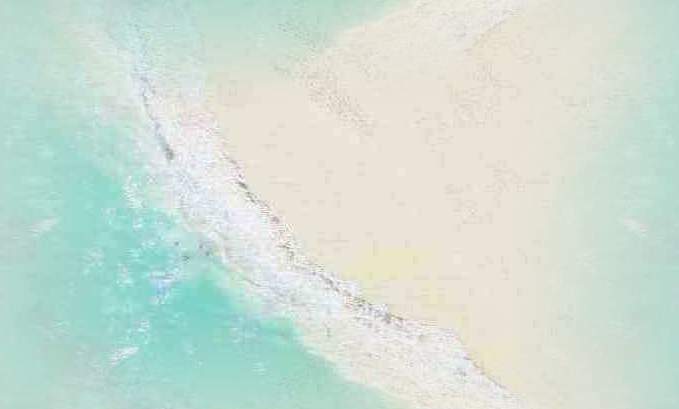 Yellow-skinned ones tend to have white flesh inside; red ones tend to have either white or red flesh. There many crunchy small black seeds scattered throughout the flesh. In some varieties, the seeds are edible. There is no apparent smell when you hold an unopened fruit up to your nose. 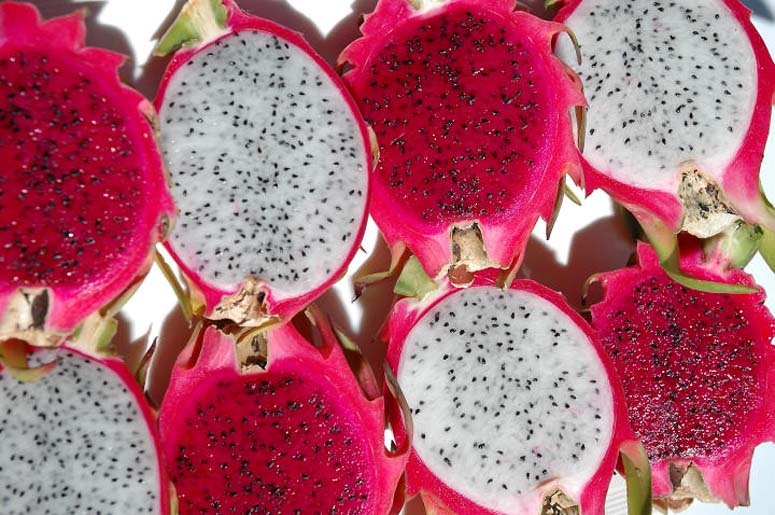 The flesh inside will be creamy and either white or pink with a delicate sweet flavour remiscent of melon and edible seeds (for the most part) throughout it, as the Kiwi fruit does. It has a delicate, sweet flavour. 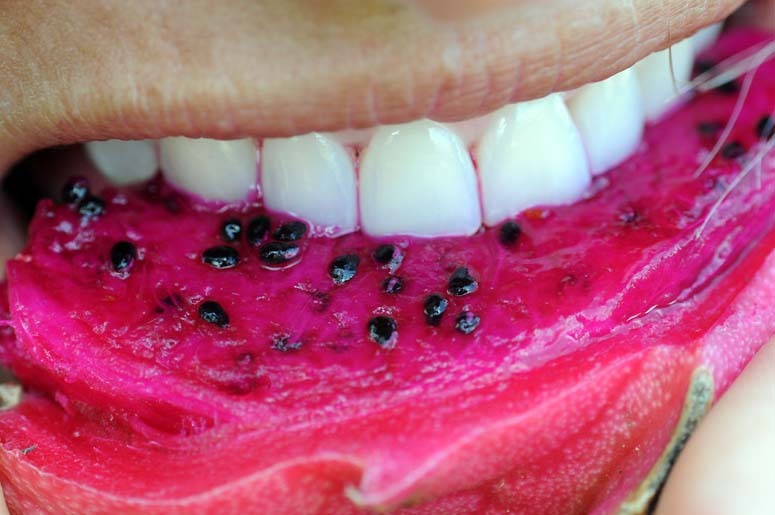 Pitahaya are being grown commercially in South America, Central America and in Israel. Love the Taiwanese who bring these things in! Choose ones that yield a bit when squeezed lightly. Best chilled. Lime or lemon juice enhances the flavour. To eat out of hand, slice in half, and use a spoon to scoop out the inside and eat it, then you eat as well the thick flesh on the walls of the fruit, like you would melon. The flesh can be puréed to use as a fruit sauce. Leave seeds in for most. Store ripe ones in the fridge; use within a week. Native to northern Central America. Now grown as well in South-East Asia. 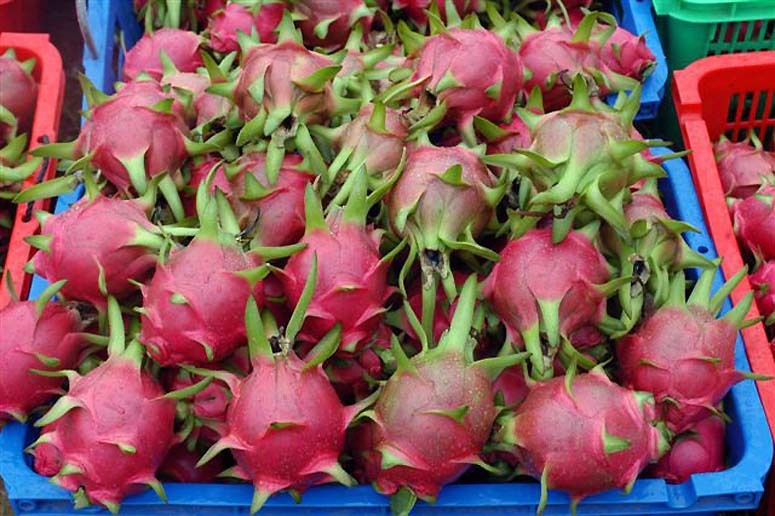 Also called / spelt: "pitahaya", "pitajaya" and "pitaya.